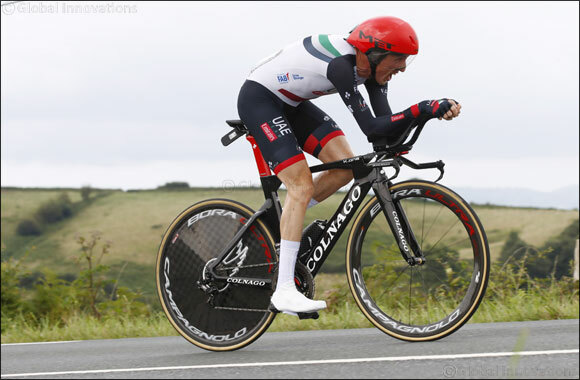 Dubai, UAE, July 29, 2018: The penultimate stage of this year’s Tour saw the world’s best riders take to the road for a 31km Individual Time Trial (ITT) between Saint Pee Sur Nivelle and Espelette. It was a day for the General Classification (GC) contenders to make their last stand and one that allowed UAE Team Emirates’ leader, Dan Martin, to cement his place in the overall top 10 standings. His solo effort, which averaged 42.7km/h over a lumpy course, was 2:26” behind the yellow jersey and kept him in 8th position ahead of tomorrow’s procession through Paris, which will only be contested by the sprinters. The ITT was won by Tom Dumoulin (Team Sunweb) in 40:52”. In addition to his Stage win and top 10 GC position, Martin rounded off his Tour by being awarded the Super Combativity prize for his aggressive, attacking style over three weeks of punishing racing. He was among eight riders shortlisted for the award, which was then decided by a public vote and jury deliberations. The title is a prestigious one and will be rewarded by a trip to the podium in Paris tomorrow – the first ever for a UAE rider on the Champs Elysees. Reflecting on the Tour he added: “It’s been an incredibly memorable Tour for me. It means so much, especially taking the first ever stage victory for UAE Team Emirates. Part of the reason I came to the team was to help create a legacy. It has been the mission of the team from the very beginning to bring cycling to the people of the UAE and to inspire the next generation of cyclists. That’s always been a passion of mine so it’s great to know that the cycling community has been glued to the TV watching us perform in France. It’s just unbelievable”. Stage 21 signals the final day of racing for the class of 2018 as they ride from Houilles to the Champs Elysees in Paris. The 116km flat route will act as a procession for Martin and his GC rivals, whose race was decided today. However, the last stage provides one more chance for the sprinters to earn themselves a podium finish – something UAE Team Emirates’ Alexander Kristoff has his sights firmly set on.